The adoption of the 2030 UN Sustainable Development Goals was a landmark for the global community and our global sustainability. Now, one year after the initiation of the goals’, it is time to really start thinking about implementing and realizing the new global agenda. And it already obvious that traditional thinking will not suffice. To reach the new global goals by 2030, there is a pressing need to think creatively and innovatively. The annual investment gap amounts to US $2.5 trillion and the shortcoming of sufficient funding requires smart solutions, leverage of private sector capital and inclusion of civil society in new ways. 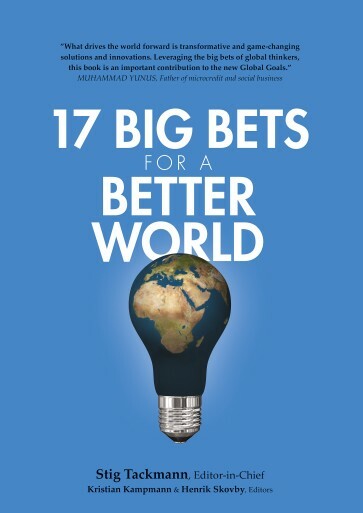 The idea behind this book is to allow some of the world’s most renowned thought-leaders to provide their perspectives on how we collectively reach the global goals. From an artist and a Michelin-chef to a bank president and a Nobel Peace Prize winner, this book presents innovative, bold, and credible solutions to the challenges we face as humanity. Nandan Nilekani & Varad Pande: Nandan Nilekani is Chairman of the Unique Identification Authority of India. Varad Pande is Partner and Co-Lead of Financial Inclusion at Dalberg. Dan Barber: Chef of Blue Hill, a restaurant in Manhattan’s West Village. Ashish J. Thakkar & James I. Mwangi: Ashish J. Thakkar founded his first business in 1996 at the age of 15. James I. Mwangi is Executive Director of the Dalberg Group. Angel Gurría: Secretary-General of the OECD since June 2006. Fabiola Gianotti: The first female Director-General of CERN. Jamie Drummond: Co-founder of ONE, a global pressure group which fights against the injustice of extreme poverty. Jacqueline Novogratz: Founded and directed the Philanthropy Workshop and the Next Generation Leadership programs at the Rockefeller Foundation. Luis Alberto Moreno: President of Inter-American Development Bank and served as Colombia’s Ambassador to the United States for seven years. Annie Leonard & Daniel Mittler: Annie Leonard is the Executive Director of Greenpeace USA. Daniel Mittler is the Political Director of Greenpeace International. James Mwangi: World-renowned for his contribution to financial inclusion in his role as the Group Managing Director and CEO of Equity Bank. Craig Silverstein & Mary Obelnicki: Founders of Echidna Giving, which works to get more girls into better schools. Danielle Nierenberg: President of Food Tank and an expert on sustainable agriculture and food issues. Amina J. Mohammed:A central player in the Sustainable Development Goals process, serving as the Special Adviser to UN Secretary-General Ban Ki-moon. Olafur Eliasson: Icelandic artist working with a wide range of media, including installation, painting, sculpture, photography, and film. Henrik Skovby: Founder and executive chairman of Dalberg Group. Stig Tackmann: Head of Dalberg’s Big Bet Initiative and is leading a number of media initiatives focusing on international affairs and global development. Stig Tackmann is heading Dalberg’s Big Bet Initiative and is leading a number of media initiatives focusing on international affairs and global development. Henrik Skovby is founder and executive chairman of Dalberg Group, an international consultancy specialized in global development.